You can reach the Arlberg area by taking the Inntal Autobahn A12 (Arlbergpass) from the east or via the Rheintal Autobahn A14 (Flexenpass) from the west. 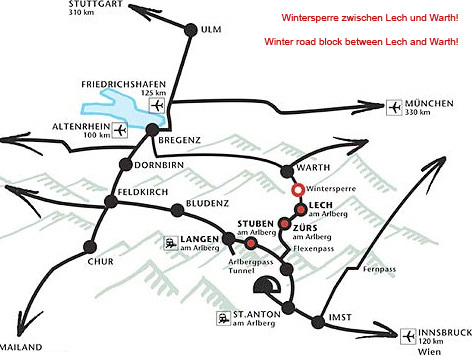 Please note that the road between Warth and Lech is closed in winter. Unfortunately, arrival via Bregenzerwald or Lechtal is not possible. Don’t want to leave your car outside in the snow? If so, we will be happy to reserve a parking space in our garage for you at a cost of € 13 per day. Simply let us know before you get here, then we will be happy to take of the rest. Nearest train stations: Langen am Arlberg (10 min) or St. Anton am Arlberg (20 min) for international express connections. Regular public buses as well as taxis will bring you from the station to Zürs. Arlberg is surrounded by a number of airports, a list of which is found here. Including the transfer time until you reach your winter fairytale-come-true and the pampering you richly deserve. Will you be arriving by train or airplane? Make it easy for yourself: Have yourself picked up and driven right to the hotel. Totally relaxed, in complete comfort. Taxi “Der Lecher” and “Arlberg-Express” have both been reliable partners of ours for many years. We are happy to provide you with contact information – better still, allow us to make the transfer arrangements on your behalf.